20th-century dark brown leather, blind-stamped exterior including "S" monogram surmounted by a coronet; gold-tooled on the interior; purple watered silk doublures. Luis de Strycker, Brussels, his or his father's monogram on binding; purchased by E. Clark Stillman around 1981; E. Clark Stillman Collection. 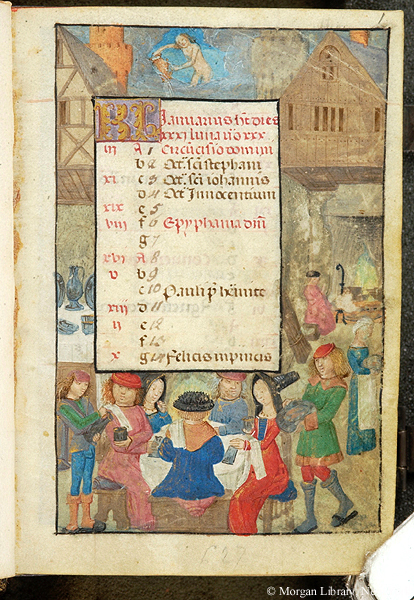 Ms. book of hours, use of Rome (Hours of the Virgin, Office of the Dead); written and illuminated in Belgium, ca. 1490. Decoration: 14 small miniatures, 46 historiated borders, 7 floral borders on gold ground; on each text page are marginal fauna and flora, hybrids and grotesques. fols. 1r-12v: Calendar -- fols. 13r-14v: Prayer to the Holy Face -- fols. 15r-24v: Hours of the Cross -- fols. 25r-33r: Hours of the Holy Spirit -- fols. 34r-42v: Mass of the Virgin -- fols. 43r-52r: Gospel Lessons -- fols. 53r-153v: Hours of the Virgin -- fols. 154r-182v: Seven Penitential Psalms, Litany, Prayers -- fols. 183r-246r: Office of the Dead -- fols. 247r-261v: Suffrages -- fols. 262r-279v: Prayers to the Virgin, including Obsecro Te and O Intemerata. Textiles: purple watered silk doublures.